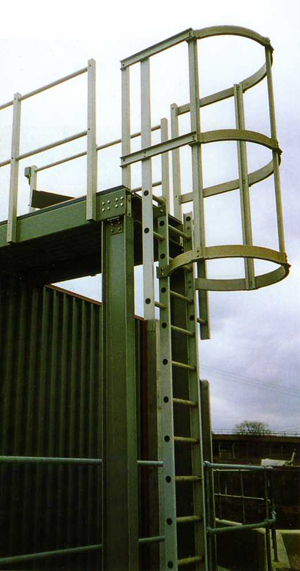 Vibro GRP ladders are designed to provide strong and safe corrosive vertical access to meet the requirements of, amongst others, the water, chemical and electrical industries. Our ladders are manufactured in G.R.P. pultrusions for the rung, stringer and, where applicable, safety cage. Our ladders conform to the dimensional requirements of B.S. 4211 (1987) “Steel ladders for permanent access” and also BS 5395 Pt 31985- “Code of practice for the design of industrial type stairs, permanent ladders and stairways”. The stringers or stiles are manufactured from a 75 x 25 x 5mm channel, and the rungs from a 34.5 O.D. deeply serrated section which gives an excellent footing in all conditions, ensuring safety. The rung is inserted into a hole pierced in the stringer and bonded in place with a tapered thermoplastic plug with the result that the load is transferred directly down the channel and means that a load of up to 5kN per rung can be applied. Ladders are normally constructed 400mm wide with rungs at 250mm pitch, and can be manufactured to the exact length required without any extra cost. The maximum single length we can suppl;y is 6m, however extra lengths can be joined by using splice plates. Fixed length modules can also be supplied in multiples of 250mm where required. Fitting Vibro GRP ladders is very easy as weighing only 3kg per metre (ladder only) they are simply maneuvered into the most awkward positions. Ladders are generally supplied with brackets fitted so that the user just had to drill one hole per bracket and secure with an M10 x 90 expanding anchor. All fittings used on our ladders are 304 grade stainless steel, but 316 grade can be supplied upon request. Vibro safety cages also conform to BS dimensions and are fabricated from moulded hoops at approximately 750mm centres linked with “top hat” section. Where required a walk through top can be supplied which can be fastened into the handrailing. We also offer a retractable handhold which locks in position to help access into difficult areas such as manholes, and when not in use can be lowered safely down the ladder. Vibro GRP handrailing is a modular system which can be adapted to fit into any area and is ideal for use around machinery or any hazard. Posts are generally supplied in 1100mm lengths which are pre-drilled at two levels to accept the handrails. They are fixed at 1500mm centres or less with a stainless steel foot bracket which is fastened using 2n M10 x 90mm expanding anchors. The post and also a 150 x 25mm kick plate channel is secured by an integral nut/ bolt assembly. The handrail post is a 38.2mm O.D. tube which is supplied in 5m lengths and which can be internally joined with a splice to make up longer lengths. We offer two angle joints as standard 45 and 90 degrees – which are bonded in place with epoxy adhesive and also mechanically fixed. Posts should preferably be within 150mm of the corner. Our handrailing is supplied in light grey as standard but is also available in yellow for extra visibility. As with all of our products Vibro GRP handrailing is designed to be maintenance free and once fitted will not require any painting or any other attention. 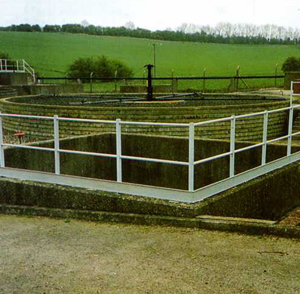 It is also ideal for use in areas where hygiene is of importance and for corrosion environments.